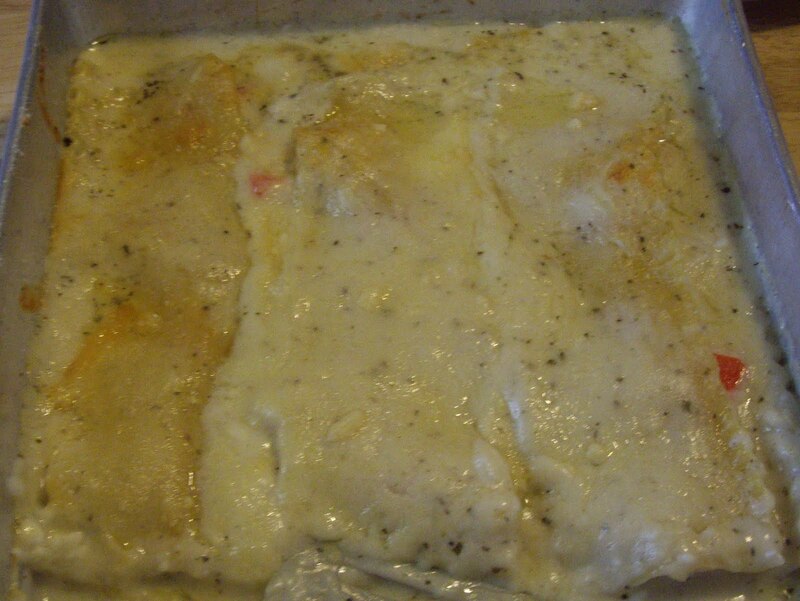 Seafood lasagna is a nice change from your traditional Italian lasagna. It is made with tiny shrimp and crab meat. Use imitation crab meat if you like. It is yummy that way as well. You will need an ungreased 9″x13″ pan. In a large saucepan, melt the butter over low heat. Add the garlic. Cook until bubbly, stirring constantly. Remove from heat and add the milk and chicken broth. Put back on heat and bring to a boil, stirring constantly. Boil and stir for a minute. Add the onion, mozzarella cheese, basil, and pepper. Cook and stir over low heat until cheese is melted and mixture is smooth. Spread 1-1/2 cups of the cheese sauce in the bottom of the baking pan. Lay three noodles over the sauce. Spread the cottage cheese over the noodles in the pan. Add another 1-1/2 cups cheese sauce. Add the crab meat(or imitation crab meat) and the shrimp. Layer with the last three noodles and the last of the cheese sauce. Sprinkle the Parmesan cheese over the top. Bake uncovered in the preheated oven for 35-40 minutes until the noodles are done. Let stand for 15 minutes before cutting. BURSTING WITH FLAVORS THIS IS A GREAT PASTA DISH!!! GIVE IT A TRY!! !